This week council had only one item to consider on its agenda, the draft 2010/2011 budget. It was supported unanimously by councillors. The $140 million budget earmarks more than $38 million for a range of capital works throughout the shire from road improvements to improvements to open space and a vast array of major projects. The budget sees council allocate an additional $730,000 to bushfire preparation works. These works include removal of roadside debris for expanded roadside slashing on strategic roads in Township Protection Plan areas as well as preparation and maintenance works at Neighbourhood Safer Places (Places of Last Resort), necessary works to improve community safety. • $7.8m to support the delivery of aged care services helping older members of the community and people with disability to remain healthy and active in their homes and local communities. • $7.7m for programs and services directed to families and young people through maternal and child health care, immunisation, youth counselling, events and leadership development. Twelve months ago Yarra Ranges Council announced its largest ever capital works program designed to support the local economy and deliver new community facilities. The $272m 10 year capital works program featured an extra $68.5m to stimulate construction in the region and help support local jobs. The 10 year program will deliver new purpose-built community, cultural and sporting facilities. It will also ensure council's assets are preserved, maintained and upgraded to provide for our community into the future. There are still challenges for the future and this budget sets a blueprint for that future. The budget supports Council's priorities for the next four years, these priorities have been identified in the Council Plan. Back in April Council resolved to develop a local law to ban sulphur crested cockatoo feeding (see blog). Part of the resolution included lobbying the Minister for Environment, Gavin Jennings, about the ongoing issues with local cockatoos. In May we wrote to the Minister seeking his support for our community, particularly those in the Kallista area, in relation to the destruction of property caused by cockatoos. Council asked the Minister for ongoing support from the Department of Sustainability and Environment to continue to campaign to educate the community of the risks to wild birds caused by feeding and associated dependency. We highlighted to the Minister the many complaints we have received from residents who have suffered extensive damage to their property, in particular to window and door frames as a result of cockatoos that congregate in residential areas. Of particular concern are the properties located close to Grants Picnic Ground where feeding of cockatoos is actively encouraged through the sale of seed from the Park Kiosk. Council has been advised by DSE experts that because the sulphur crested cockatoos have access to a ready supply of feed from the picnic grounds, they have no need to forage to naturally hone their beaks. 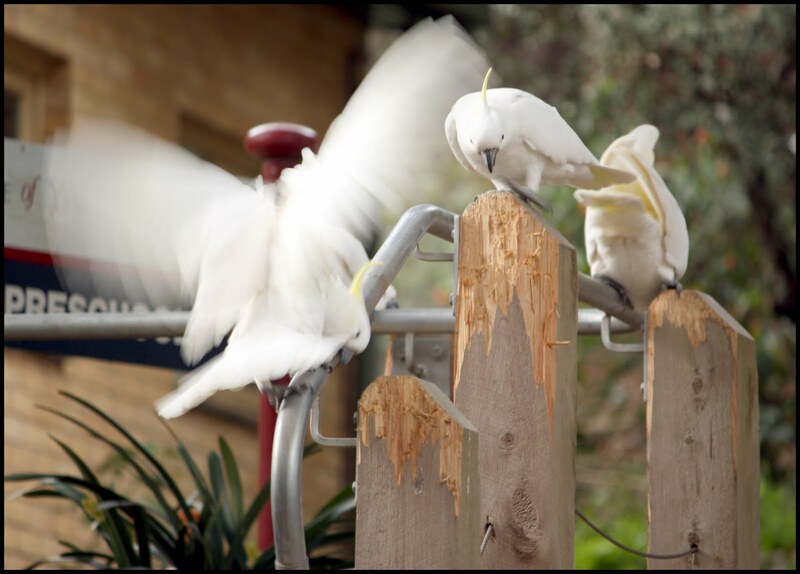 As a result of this, the cockatoos chew away at the soft timbers of residential and public property which has resulted in many thousands of dollars of damage. We outlined to the Minister the steps we have taken in relation to community education, also that we are developing a local law. We told the Minister that it is our preference that the community adopts changes in behaviour and stops feeding cockatoos. We are seeking the support of the Minister to modify the licence conditions of the kiosk at Grants Picnic Ground to prohibit the selling of wild bird seed. We also asked the Minister for extensive signage to be installed in the Dandenong Ranges National Park and formal contact be made with tour operators advising users that feeding is prohibited in the national park. It is the first step in lobbying the Minister on this issue, I hope he's listening as the cockatoos have already started chewing away again for season 2010. 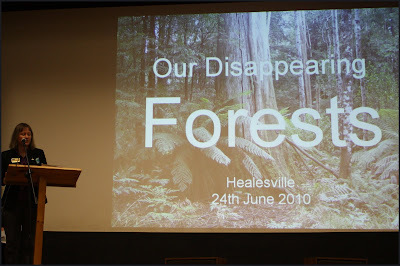 Last Thursday saw around 300 community members gather at the Memorial Hall in Healesville to learn about logging in the local area. 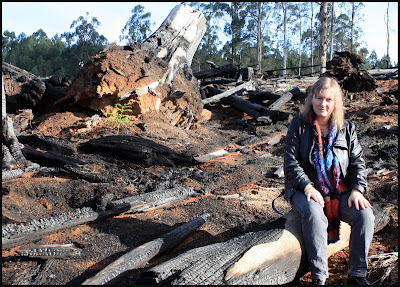 Concern has been growing since Vic Forests have started logging in the Toolangi region, compacted by continual traffic from logging trucks at all hours of the day and night. Local community members and environment groups came together to organise a forum to talk about logging in the region. Many people spoke on many subjects. I was asked to speak about the Yarra Ranges economy and where logging fits into that economy. The figures I used came from the Australian Bureau of Statistics (ABS) and other economic analysis done for the Shire in 2008. We often hear "the timber industry is a significant economic, environmental and social contributor to the local economy", I was asked to talk about this and explore what the key drivers are in the Yarra Ranges economy. I started by talking about employment. Current figures show the shire has 35,289 workers, with the Retail, Manufacturing, Education and Construction sectors employing the bulk of workers (around 50%). The Retail sector employs the higher number of workers at 18.3% (6,435), whilst Agriculture, Forests and Fishing employs 5% (1,772 jobs). Now when the ABS collates figures they pool together Agriculture, Forestry and Fishing, so it represents all 3 sectors as a lump sum. In Yarra Ranges, the highest employer in that particular sector is Agriculture, when the figures are broken down to Timber and Fishing it represents 91 jobs or 0.3% of total employment in the shire. Now how does this translate to dollars? There is no doubt when you look at the economic data Yarra Ranges' key industry sectors are Manufacturing, Property & Business, Retail, Education, Agriculture and Construction. Tourism is also key driver, it doesn't have a classification of its own, but it influences Manufacturing (wine production), Agriculture (grapes, berries, nurseries) and Accommodation, Cafes & Restaurants, it is another significant contributor to the local economy. Value to the economy can be expressed various ways, at the forum I talked about Gross Industry Output and Value Added totals. Gross Industry Output is about the gross revenue generated by business, Value Added is the total market value of goods after deducting costs of goods and services used to produce the goods. Across the Shire the total output, so gross revenue, generated is $9.019 billion. Of this Manufacturing is by far the greatest sector at $3.043 billion (33.7%), whilst Agriculture, Forestry and Fishing is worth $381 million (4.2%), of this when we split out just Forestry and Fishing it is valued at $24 million or 0.2% of our economy in gross terms. Across the Shire the total Value Added revenue generated is $3.514 billion. Once again Manufacturing tops the scale worth $672 million (19.1%), Agriculture, Forestry and Fishing comes in at $210 million (6%), and when we drill down to Forestry and Fishing we find it's worth $12 million or 0.3% of our local economy in value added terms. On the night I didn't talk about the costs in relation to infrastructure, but there is an impact on local roads and bridges and that's a cost borne by ratepayers and taxpayers. I am saying there are jobs in the timber industry but it's time to transition to plantations and get out of native forests. 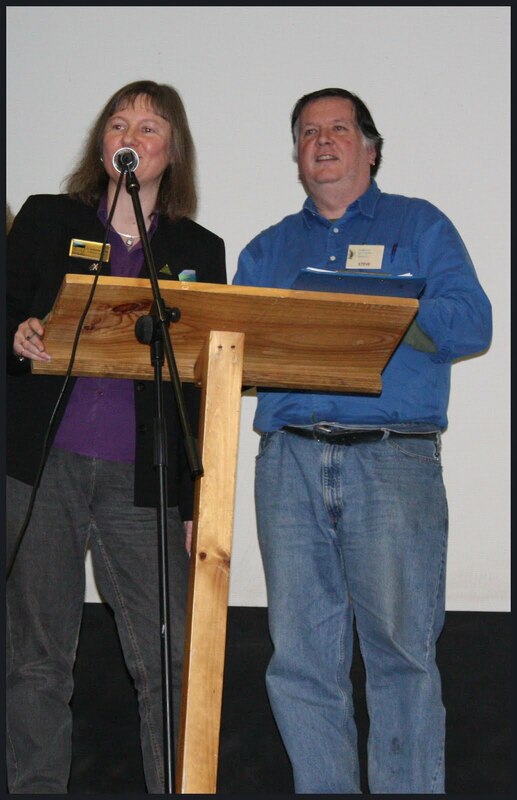 I didn't talk about woodchips either and the fact that over 80% of logged forests are woodchipped. What I did say to community members on the night is that when the timber industry says it is a significant driver in our economy we must look at the facts. Manufacturing is a force in Yarra Ranges, however let's get to tourism – a real growth area in the Shire of Yarra Ranges. 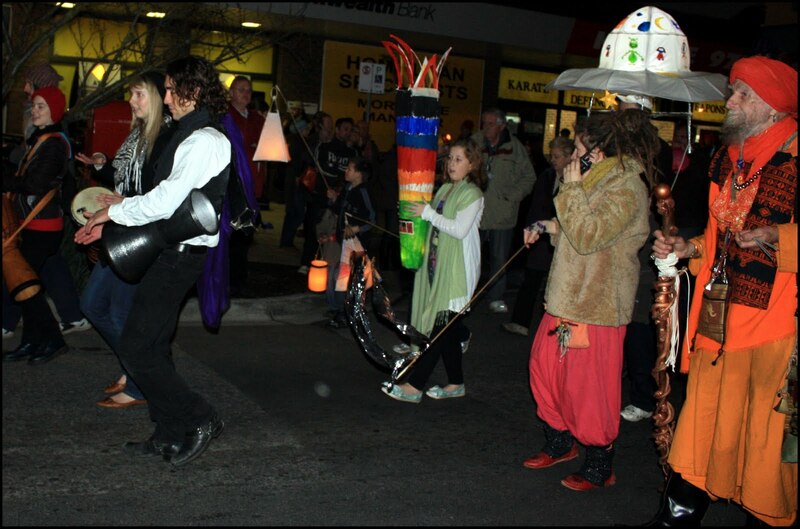 A significant number of business in tourist towns, and Healesville is most definately a tourism town, receive significant direct and indirect benefits from tourism. As outlined earlier Tourism operates over a number of industry sectors so other methods need to be used to determine economic activity. The Shire's current calculations determine that tourism is worth $381 million per annum and is responsible for employing 2,059 people. That's 4.22% of our economy and 5.83% of the Shire's employment. When we look at the data it is clear what industry sectors are the fundamental drivers of the economy in Yarra Ranges. The Yarra Ranges Council sees our strength is preserving our environment, to encourage even greater visitation rates, it is our natural beauty that attracts people to the region. The Shire of Yarra Ranges has long been recognised as a special place for its natural beauty and diverse habitats. The combination of national parks, state forests, private gardens and its location on the doorstep of Melbourne all combine to make the area unique in its natural, cultural and amenity values. The Shire contains some of the most environmentally important areas in Victoria, which are a significant factor in attracting residents and tourists. 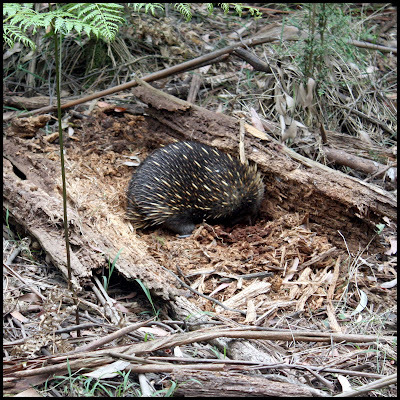 Yarra Ranges contains significant areas of remnant native vegetation, much of which is botanically and zoologically significant, providing important habitat for wildlife. The Shire, and in particular the 'Yarra Valley', is gaining local and international recognition as a fine food and wine producing area. Each year, over 2.2 million tourists visit the area, including the wineries of the Yarra Valley and the townships and gardens of the Dandenong Ranges. 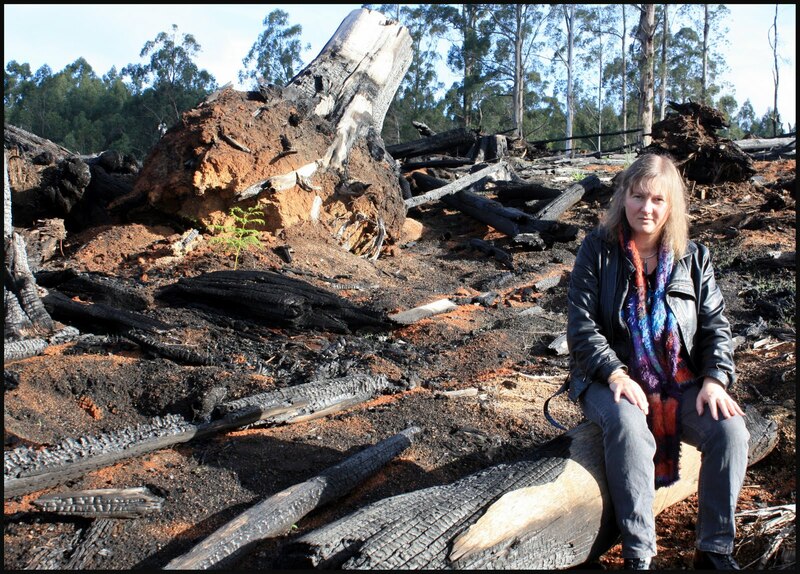 As a council we don't think the government should be allowing the ongoing destruction of our native forests in the Toolangi region (let alone water catchments) due to the significant impact it will have on tourism in the region. Healesville is a town that is trying to get back to a more stable trading environment after the fires and it is tourism which will provide a great way to secure Healesville's future. where is our transport policy? 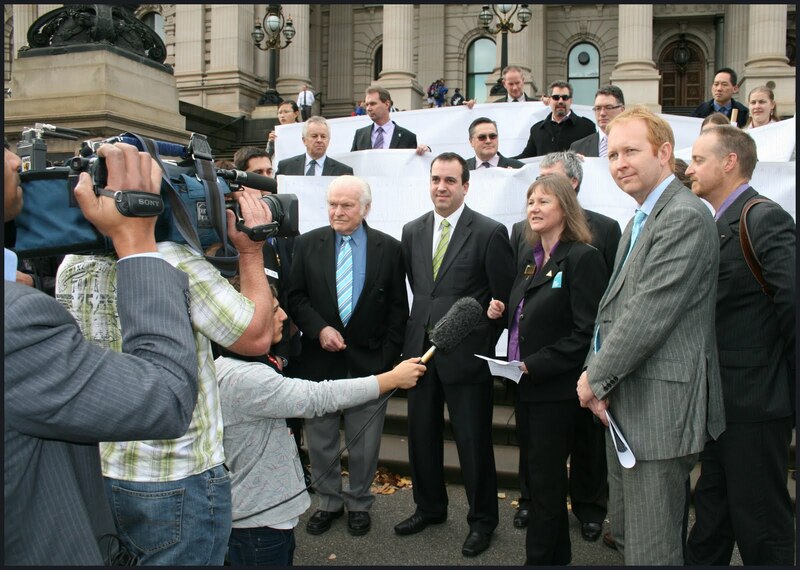 Thursday was the day the Eastern Transport Coalition's Monster Petition was delivered to parliament. 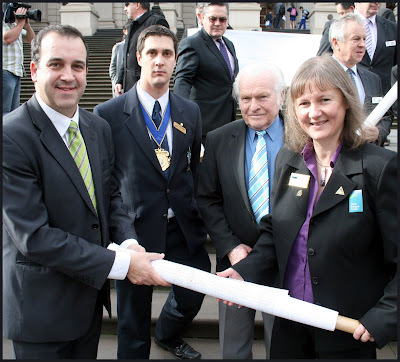 As the Chairperson of the ETC I had the job of presenting the petition to Minister for Public Transport, Martin Pakula. Me handing the monster petition over to Minister Pakula, I was pleased to see the Minister accepting the petition on behalf of the one million residents in the East. I was joined by Mayors, Councillors and officers from the seven ETC member councils which represent over 1 million Melburnians, around a quarter of Melbourne's population. 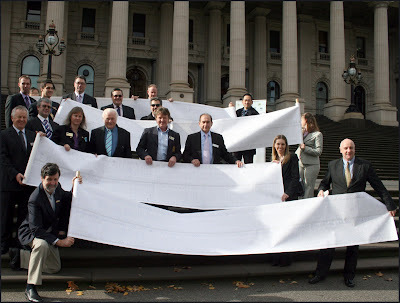 The petition, spanning some 60 metres, is the longest petition presented to government for some time and certainly the longest this century. It was good to see all political parties meet the ETC on the steps of parliament. It is a recognition of the importance of the issue. In speaking on the day I talked about the neglect of one million residents in the east, I asked the government to start doing their homework into sustainable transport solutions, like the Rowville and Doncaster rail. I asked the Minister to focus the efforts of government across all of Melbourne, and not just a few key electorates. The monster petition, 60 metres long and signed by over 13,500 eastern residents, is a message to government to end the neglect. I was pleased to be able to present the petition to Minister Pakula on behalf of our communities. It is important that we see some action from government on this issue, we don't want to see the petition condemned to the bowels of parliament house to gather dust, it is time to act on behalf of those million residents in the East who are crying out for sustainable transport solutions. It was pleasing to see that all sides of Parliament met the ETC on the steps of parliament, Minister Martin Pakula, Terry Mulder – Opposition Spokesperson on Transport and Greg Barber – Greens Spokesperson on Public Transport were all there. It's clearly an issue that is important, now let's make sure that we see action. Back in March 2009, Council adopted the Carbon Management Program to support the implementation of our Resource Management Strategy (2007). This program seeks to implement some 17 top priority retrofit actions to reduce council's greenhouse gas emissions. One of the most significant actions in the program is the replacement of street lighting with more sustainable lights. It plans to replace approx 6,670 street lights in Yarra Ranges using Twin 14W T5 lamps, which use approximately 65% less energy than the existing 80W mercury vapour (80W MV) street lights. The changeover of street lights will make a huge difference to our corporate greenhouse gas emissions. Not only that it is good for our bottom line with the change to the more energy efficient lighting becoming cash flow positive by 2019. I was pleased to move the motion to see the changeover of street lighting in Yarra Ranges. Whilst talking to the motion I reminded councillors of the advocacy campaign we joined in February this year, to pressure the state government to support local government to make the transition to energy efficient street lighting. 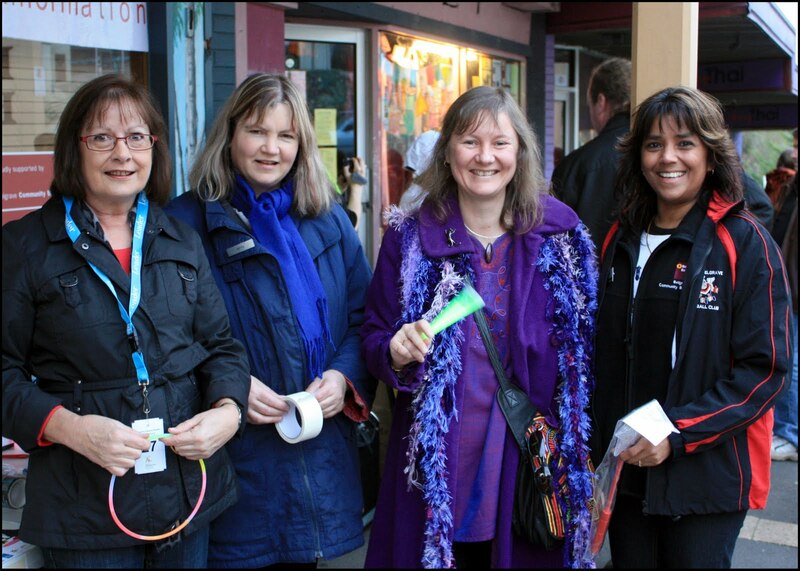 If all municipalities in Victoria had energy efficient lighting it would save 1.5million tonnes of Co2 emissions. Part of the campaign includes an online petition, I encourage you to sign up, the more who sign the more the issue will resonate with government. If you want to know more visit greenlightourstreets.com.au. Council had to consider a very controversial application at this week's council meeting. The application was to use and develop land as a golf course and turf farm on floodplain next to the Yarra River in Yering. Given its location and use it was a very complex application. Anthony Amis, Land Use Researcher with Friends of the Earth, presented to council as an objector to the application raising many issues. He talked about the heritage values of the site, the endangered species at risk, the value of the green wedge and regional strategy plan, the risks to Melbourne's water supply via Sugarloaf, the extensive water use required, the chemicals typically used at golf courses and past accidents on golf courses adjacent to waterways. He also showed a photo of the extent of water inundation in a one in one year flood. It was certainly food for thought and highlighted how complicated this application was. Michael Dieden, a town planner, represented the applicant and came under question by many councillors. I was concerned about the chemical use on site. Melbourne Water as part of their referral has given permission for the course to use three herbicides but nothing else. Golf courses are renowned for the use of a complicated mix of insecticides, fungicides, herbicides and pesticides (not to mention fertilizers), many of them toxic to fish. I wanted to be sure that the applicants were committed to only using these three herbicides and was assured by Mr Dieden that chemical usage would be restricted to only those three herbicides and fertilizers. I am curious as to how the club will deal with insect infestation or fungal attacks to the greens. I could not support the motion to allow the golf course to proceed. I had too many concerns. The first was water use on site. The application talks about water licences for 70 megalitres (mL) overland flow, 200 mL of B Class recycled water, 250 mL of water from the Yarra River and 120K Lt to be collected from the roof. That's a staggering amount of water and shows how water intensive this site is, I didn't think that fitted with the aspirations of the green wedge to encourage development that is consistent with sustainable land management practices. The chemicals, including fertilizers, continue to bother me, I will be very surprised if the club only uses the three chemicals allowed by Melbourne Water. The location of the course on the Yarra River flood plains makes it very easy for contamination and sedimentation in a low flood event, let alone an extreme flood event, of which we seem to have more and more. I think it is a poor use of green wedge land. Our planning scheme makes it very clear what green wedge land is for and I didn't think this application was a good fit. I lament the loss of land for agricultural use and the loss of access to water for our agricultural businesses. I didn't believe the golf course would be good for tourism, with its location a long way from any of our townships I don't believe there will be many benefits that flow to our tourism townships as all the money will stay within the golf club. I had concerns that the application was being packaged as a benefit to the public, but there is no public access to the site unless you are a member (full or social) or attending a function on site. I was alarmed to read that one of the controls being entertained to preserve native vegetation was the culling of kangaroos, another reason to not support this application. I think the turf farm is exploiting a loop hole in the planning scheme that says that the land use must be in conjunction with an agricultural use. In a time when we are trying to discourage the use of grass because it is so water hungry, a turf farm doesn't seem a sensible choice for an agricultural pursuit in the Yarra Valley. But it does provide a link to agriculture which is required in the planning scheme. It is a water guzzling enterprise and is inconsistent with our Regional Strategy Plan. I urged councillors to use the precautionary principle and vote against the motion. My concerns for the loss of agricultural land, our environment, the Yarra River and the drinking water of 1.5 million Melburnians far outweighed the positive elements of the application. The motion to support the application was moved by Cr Higgins and seconded by Cr Avery. It was a very close 5/4 vote. I called for a division so the record would show who voted for and against. Last Saturday saw thousands of locals come out to support the Lantern Festival in Belgrave. 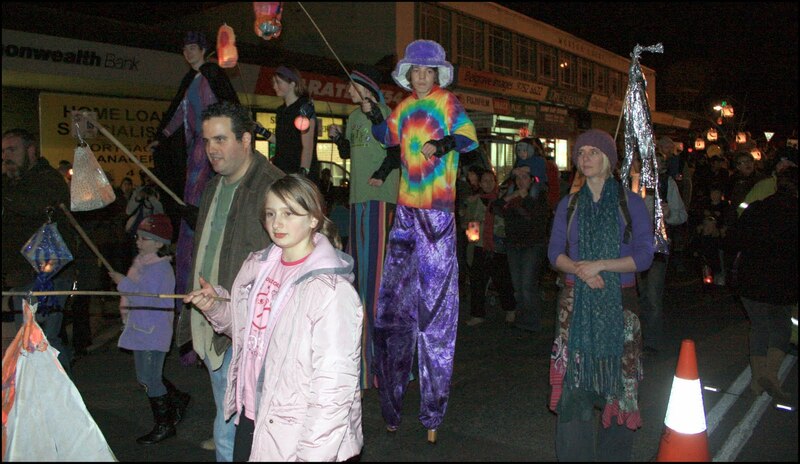 Once again the festival was well supported by the community, the streets filled with people either watching the parade or locals marching with a cavalcade of creative lanterns. The Mater Christi College School Band started the festival's proceedings by providing some street music. The lantern festival is a great opportunity to be creative and be part of a wonderful community celebration. The Belgrave Bendigo Bank are keen supporters of the lantern parade and were out in force supplying the crowd with glow products. Stax provided entertainment while the crowds gathered. The Crowd gathered at Hayes Car Park to assemble for the parade. Emma from Tecoma Primary School led the parade with her Olympic Torch lantern. Renata was joined by fellow Pharaohs to create this magnificent sphinx lantern. 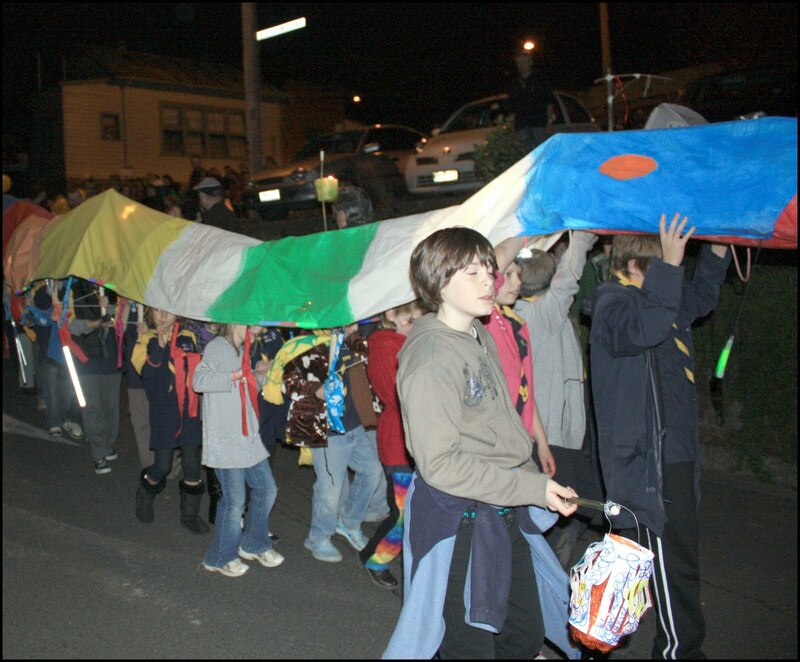 The Upwey Scouts were there in an amazing lantern creation with room for the entire troupe. Jordan Crooka from Sherbrooke Community School created a Sea Shepherd lantern, there's no doubting his passion for all things Sea Shepherd. 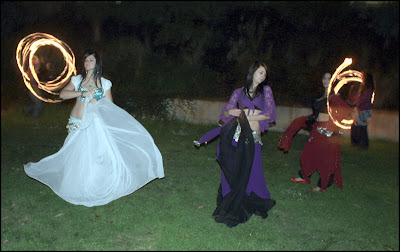 After the lantern parade, festival goers were treated to belly dancing and fire twirling. talking art – what do you think? 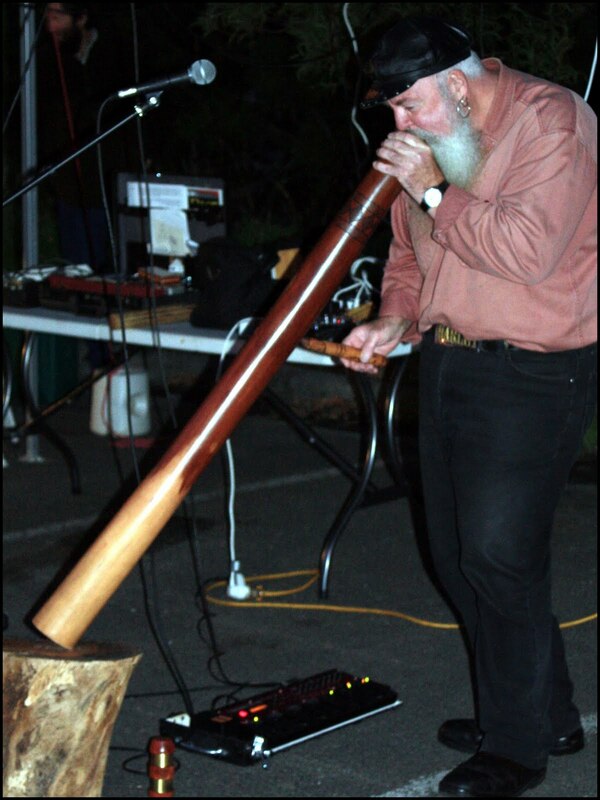 Yarra Ranges Council wants to talk about art in public places and we want to know what you think. 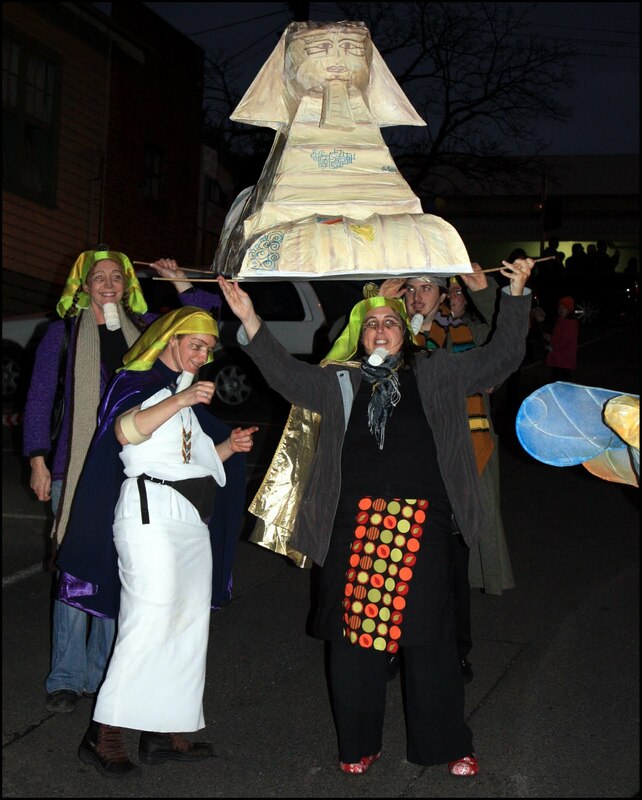 When Yarra Ranges completed the consultation for the Cultural Plan, art in public places was nominated as the highest priority for arts and heritage activity. So we want to know more. To discuss ideas and receive feedback from the community across art in public places and a range of other Council initiatives, Yarra Ranges Council has established an online discussion website called Yarra Ranges Views. If you’d like to contribute to the Art in Public Places online discussion click here. It's easy to participate in the art in public places online discussion and you can do it whenever you like, any time of the day or night. When you arrive "sign up" and allocate yourself a "username" and a "password" and let your comments flow. There are some questions to prompt or you can simply agree or disagree with other views. There are three discussion leaders who will guide the conversation so you don't need to be an expert. This month will see the second Sherbrooke Transition Towns Food Swap. Produce available includes fresh fruit, vegetables, fresh herbs, plants, seeds, seedlings and eggs (although there aren't a lot of eggs around at the moment as some chooks are taking their winter break). The Food Swap allows for growers to either swap, or sell home grown produce and Sherbrooke Transition Towns are keen to increase the number of growers. Their aim is to provide access to good healthy food while increasing local food availability. The Sherbrooke Transition Town's food group wants to support you in combating the effects of climate change by reducing your family's food miles. The Food Swap has been designed to create more community awareness around food issues along with increasing community resilience. It is a great initiative and encourages those with surplus fruit and veg to stay local and swap for other fruit and veg. If you'd like to know more please contact Michelle from Sherbrooke Transition Towns on 0409 526 862. 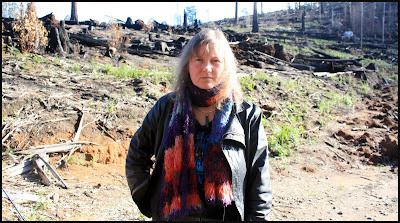 That Council write to Mr Ben Hardman MP, the Minister for Agriculture, Mr Joe Helper, the Minister for Environment, Mr Gavin Jennings and the Premier, Mr Brumby, calling for an immediate halt to current logging and any future logging proposed on the Bicentennial Trail and Mt St Leonards due to significant adverse impacts on the local economy, tourism features and the environment. This is a logging coupe in the Central Highlands (which includes the Toolangi region). If logging continues in the region, key areas will turn into this and will impact greatly on our thriving tourism industry in Yarra Ranges. I was happy to support the motion. In speaking to the motion I talked about the importance of Mt St Leonards and the Bicentennial Trail to tourism and biodiversity in the shire. The Bicentennial Trail is a significant tourism icon not only to Yarra Ranges, but to Victoria and Australia. There is nothing like it in the world and it is immensely popular with horseriders. As it stands at the moment it is currently illegal to use some parts of the trail due to current logging operations, this is shocking use of a tourism icon and its degradation by logging will have a significant impact on tourism in the region and beyond. Mt St Leonard is an iconic mountain in the shire, it can be seen from Kew, such is its prominence in the landscape. It is a jewel in our landscape, but it is currently being tarnished from logging operations. To make matters worse the wood logged will be mostly woodchipped. 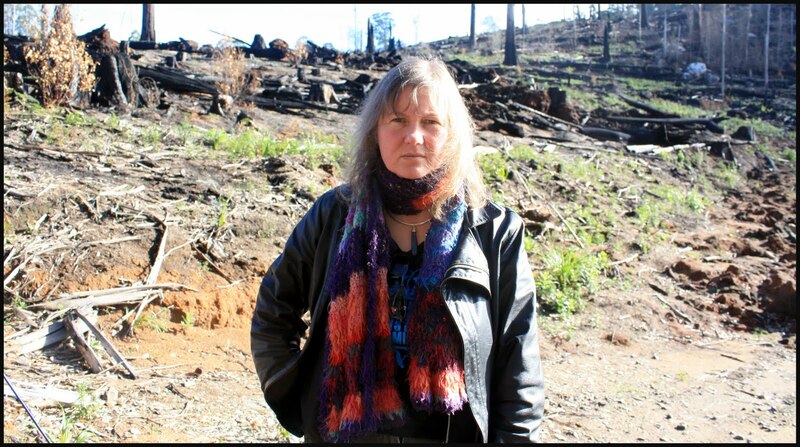 We should be focusing on Mt St Leonards as a biodiversity sanctuary, not a woodchipping supply and it would be far better placed being incorporated into the adjoining Yarra Ranges National Park where it could be preserved for future generations. I urged the ministers to intervene because they have the power to do so. Our community's future lies in tourism not wasted in woodchips. I'm pleased to say the motion was supported unanimously. At this week's council meeting I moved a motion that council support signing the Boobook Declaration. I thought it was an important advocacy campaign for council to support as its focus is on increasing federal funding to safeguard biodiversity. 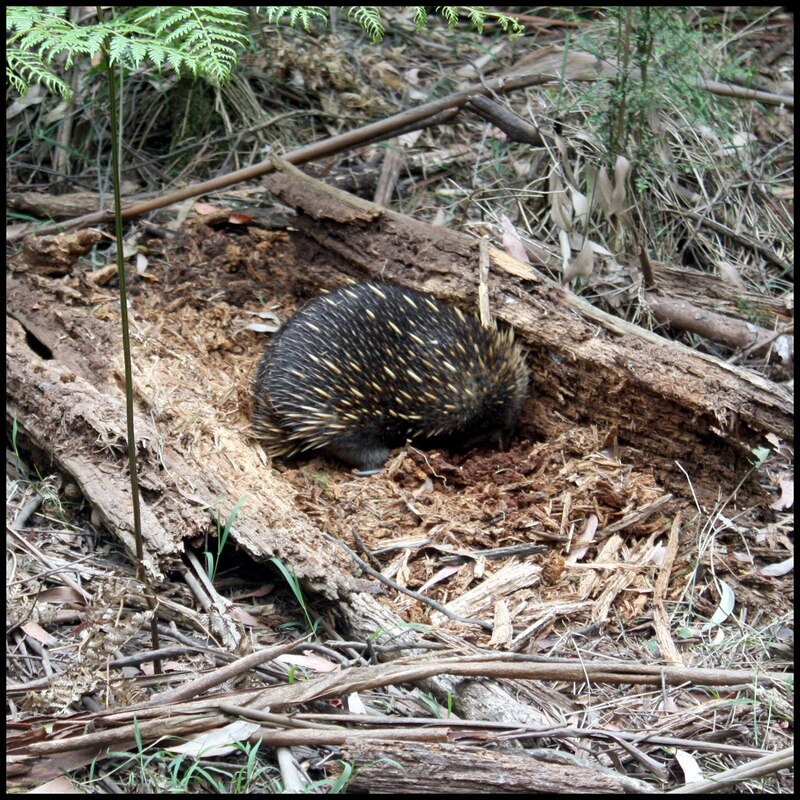 An echidna in Sherbrooke Forest, we're very fortunate to live near a forest brimming with life, but it's under pressure too, from pest plants and feral animals. The declaration came about from environmental groups concerned about the lack of recognition of importance of and funding for biodiversity. The declaration was developed as an advocacy tool to put pressure on government to triple spending on biodiversity and the group steering the project have been working away to gain a groundswell of support to further pressure federal government. So far over 60 groups support the Boobook Declaration with Yarra Ranges being the first local government to do so. We currently see ecosystems collapsing before our very eyes, the rate of extinction in this country, the greatest in the world. It is a critical issue that needs the commitment of government at all levels. We are very privileged in Yarra Ranges, we are home to three of the state's emblems, the Helmeted Honeyeater, Leadbeater's Possum and Common Heath, healthy ecosystems are very important to us and not only provide us with a healthy environment to live in but draw in millions of visitors every year. 1. Acknowledge the critical importance of safeguarding biodiversity as part of Australia's climate change response and commit to correspondingly urgent action to address the systemic drivers of biodiversity loss. 2. Increase investment in biodiversity and ecosystem protection, restoration and management to at least $9 billion over the three years to 2012 and establish an independent consultative process into future funding and stewardship of Australia's terrestrial, aquatic and marine biodiversity. (b) Notifies the Boobook Organising Committee of our support and supply the necessary information to recognise Council's support. I'm pleased to report that council supported the motion unanimously. blog). The motion was supported unanimously. Changing the street lighting to more energy efficient lighting would save over 1.5 million tonnes of CO2 emissions in Victoria alone. Street lights contribute significantly to emissions of local government but many councils do not have the capacity to change to the more energy efficient lighting. A financial contribution from state government would ease the burden on local government and allow considerable inroads into reducing the state's carbon emissions, there is no doubt this contribution is well overdue. Part of the campaign includes an online petition. I urge you to support the petition. With the help of many people supporting the campaign we'll bring much more pressure on state and federal government to take some action. You can support the Greenlight our Streets campaign by clicking here. 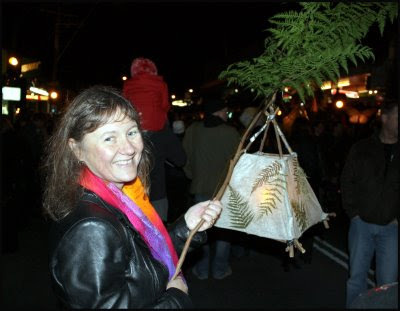 With less than one week to go it's time to hone your lantern making skills for this year's Lantern Parade, Make it Yours, in Belgrave. 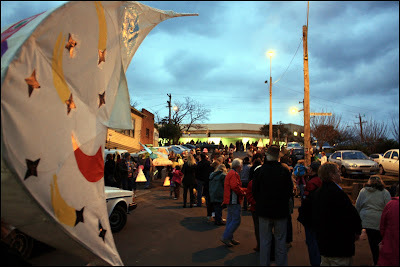 2010 marks the fourth year of this terrific community celebration of winter solstice. 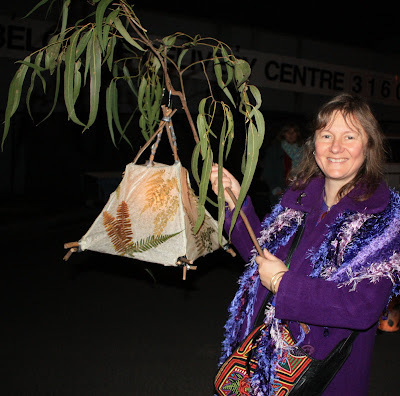 Me at last year's lantern festival, every year the festival goes from strength to strength, great to parade or just to watch, there's something for everybody. You can come along and walk in the parade with your lantern or join onlookers along Burwood Highway to watch the beautiful display of lanterns created by a diverse group of community members. If you're marching in the parade assemble from 4:45pm at Hayes Car Park (in between Book Barn and La Collina) where you'll start the parade by walking down Blacksmiths Way at the rear of the shops. For those coming along for viewing, the parade is due to start at 5:30pm. 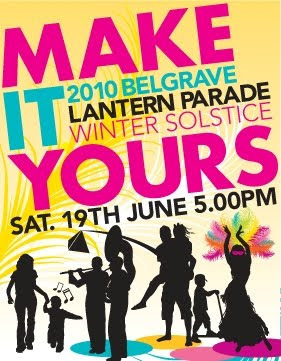 Make it Yours Belgrave Lantern Parade includes music, circus performance, drumming and much much more. 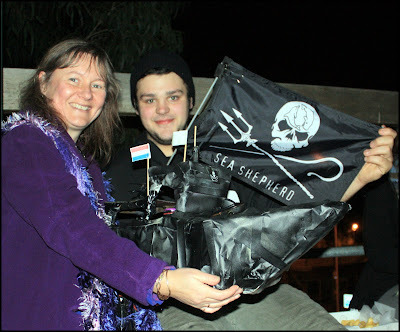 It's a wonderful event, I've always been a keen supporter of the festival assisting wherever I can to make sure the event is a success. 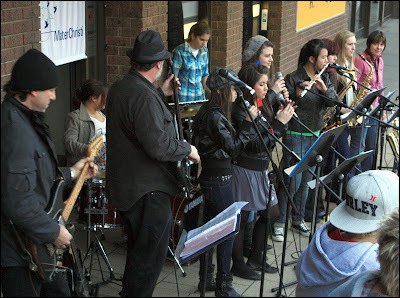 Visit one of Belgrave's many cafes, restaurants and nights spots – that's what I'll be doing, hope to see you there! Council had to consider an application to remove 157 trees and 3 patches of native vegetation to construct reticulated sewerage throughout Belgrave South and Heights. There was no doubt that it was a complex application, when considering the matter both the range of flora and fauna affected as well as the challenging terrain made the application a difficult one. South East Water (the applicants) had to apply to remove vegetation on a 'worst case scenario' as many of the construction techniques they will be using will try to avoid removing as many trees as possible. But those who know the area will know about the rocks that float below the surface, which always provide challenges for anyone trying to dig or tunnel. I have been on site visits to discuss vegetation removal and construction of the sewerage lines. I have also attended the two community consultation sessions run by South East Water (SEWL). I was satisfied that SEWL will do everything they can to retain as many trees as possible. I also look forward to any vegetation offsets required from any vegetation removal being retained in the local region. When we consider the environmental impacts of failing septic tanks they are immense. Polluting ground and surface water, creating native vegetation dieback and an influx of weeds, not to mention E Coli being released into our streets during storm events from septic tanks. I think one of the stand out things for me with this application is that in an area that values its environment we didn't have a single objector to the application because the community can see the immense benefits to going to a reticulated sewerage system. I was happy to move the motion, the reticulated sewerage would give over 800 households in Belgrave Heights and South the opportunity to connect and would have significant benefits to our environment and local waterways. There are far many more gains with this one than losses. It was great to join with community to celebrate reconciliation week last week. Speakers on the day included elders, Aunty Dot Peters and Uncle Henry Atkinson. 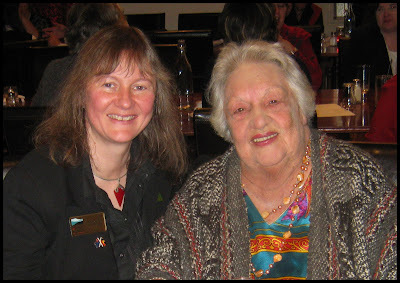 Aunty Dot and I at the Let's Walk the Mile, Let's Reconcile celebration in Healesville. Yarra Ranges was the first government of any tier to formally say sorry to indigenous people. We are committed and proud to stand by our indigenous community. Uncle Henry Atkinson talked about the lack of equality for indigenous people when it came to employment, education, housing and health. He talked about the lack of fairness and equality and that there has been no compensation for the Stolen Generation. Uncle Henry's went on to say "our ancestors didn't give up and neither should we". Compelling, as always, Uncle Henry is a strong advocate for reconciliation and indigenous rights. Part of celebrations included the launch of the Shire's Practical Indigenous Protocols. 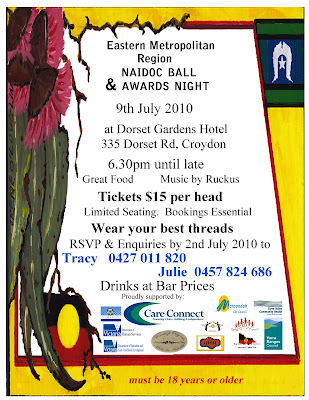 The protocols are a practical guide for working with the indigenous community in the Shire. It has broad application and helps people gain an understanding of our Indigenous heritage and history and to acknowledge and learn how this affects us today. The protocols talk about how to communicate and collaborate together with respect and in a culturally appropriate fashion. Indigenous communities in Victoria continue to face intolerable inequities in health, education, employment, the provision of public services and justice. We must focus on grassroots and state-wide solutions that result in local, regional and systemic reconciliation. We must eradicate individual and institutional racism. Only with these measures we can start to address these intolerable inequities and work to true reconciliation and self determination. I have always been a strong advocate for indigenous rights and self determination and will continue to push for reconciliation and equality for our indigenous community. Trader and Township groups across the shire are helping keep local streets free from tagging using Council's latest initiative in graffiti cleanup, the 'Portable Graffiti Removal Kit'. From left to right: Cr Samantha Dunn - Lyster Ward, Alan Fincher - Monbulk Police, Merryn Auldist - Graffiti Officer from the Shire and Linda Hancock - Community Safety Victoria Police checking out the contents of the graffiti wheelie bin. The kits, which are conveniently stored in a wheelie bin, are equipped with graffiti removal chemicals, paint, brushes, bins, goggles and gloves to assist traders to safely remove tagging from small areas including windows, walls, signs and other areas. After the success of our Graffiti Trailer, the wheelie bin kits have been developed to provide an easy way for Trader and Township groups to remove tagging as soon as it happens. Their portability makes them very easy to transport to locations where graffiti needs to be removed. 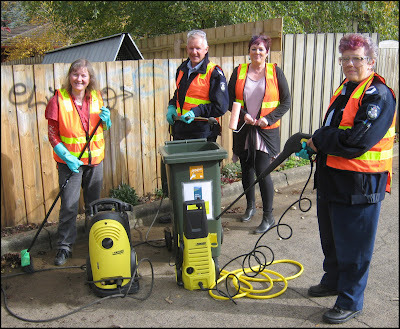 The Wheelie Bin Graffiti Removal Kits are available for local use in Belgrave, Healesville, Kilsyth, Monbulk, Montrose, Mooroolbark, Mount Evelyn , Tecoma, Wandin North and Yarra Junction. Trader, Township and Community groups wishing to use the graffiti trailer or the new portable wheelie bin kits can contact Council's Community Links or Yarra Ranges Youth Services on 9294 6750. Did you know that as a resident you can get a free graffiti removal kit at any of the Shire's community links? Just pop in to one of our links and ask for one if you need one.